The Vegetable Butcher is located at 712 Marsh St. and open for lunch and dinner Monday through Sunday from 11 a.m. to 9:30 p.m. A brunch menu and outdoor take-away window is forthcoming, so keep an eye out. For more information, call (480) 559-3557, follow @vegetablebutcher on Instagram, or like the business on Facebook. 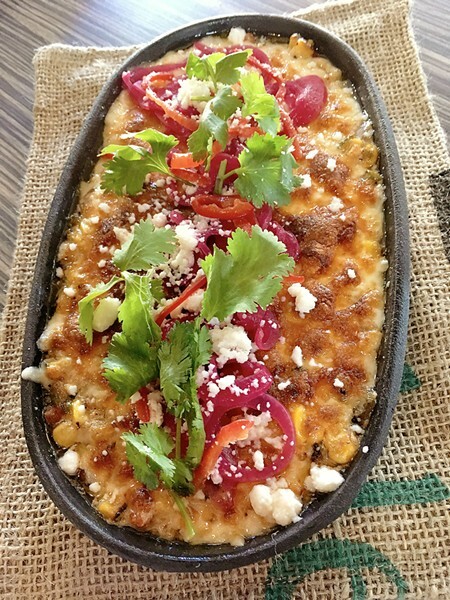 SHARING IS CARING The Vegetable Butcher's Queso Fundido is perfect for sharing with friends over a glass of wine or craft beer. Chef Becky Windels does not stop at "good." In her life and in her dishes, she pushes through to something better than good, something that blows her own mind. Her fans call it "happy food," and I understand why. I mean, how good can one vegan black bean and kale enchilada topped with cashew crema truly be? The answer is explosively delicious. I am talking about lick-your-plate amazing. Try the ancho chocolate turkey mole tacos topped with hibiscus red onion, sesame, and lime. Drizzle on a little house-made habanero hot sauce, and you will find this meaty delicacy to be just as thrilling as the vegan option. Same goes for the fluffy smoked trout beignet topped with bright pickle, dill, and cherry bomb pepper mayo. From the house salad—with pops of sweet dried corn, radish, bourbon pumpkin seeds, and creamy avocado—to the down-home crunch of the fried chicken taco topped with jalapeño poppy slaw and gold pea shoots—The Vegetable Butcher offers up a flavor-melding Latin American and world-inspired menu that is not limited by its plant-based bias. In fact, it's the very opposite. These leafy seasonal wonders elevate the show and add oodles of personality. The chef thinks of her dishes from the ground up. She's not concerned with tofu or tempeh. 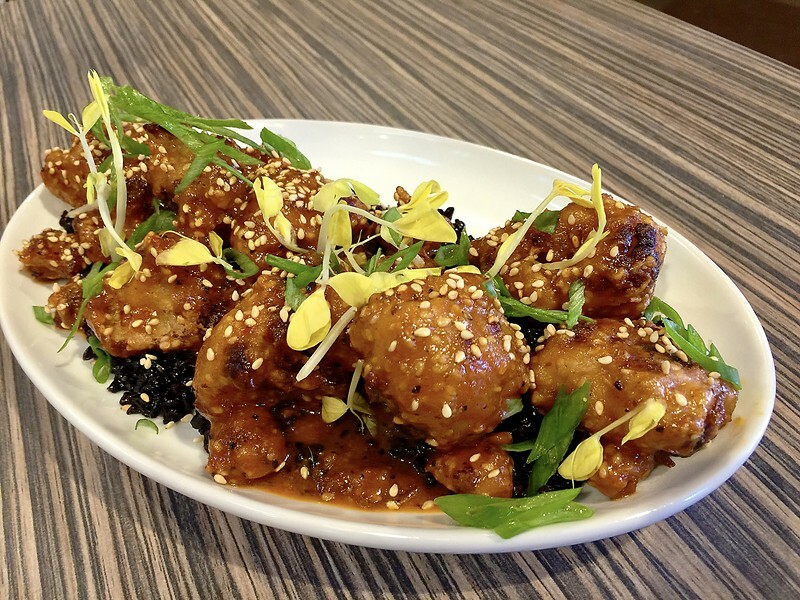 DON'T MISS THE MEAT Korean heirloom cauliflower wows with black rice, sesame, and gold pea shoots. "I don't tweak anything to make it vegetarian, and I don't do protein substitutions," she said. "A customer might say they hate kale or butternut squash, but then I get them to eat the whole thing without feeling like they missed any meat at all." Yes, you can totally eat 100 percent vegan, vegetarian, and gluten free at The Vegetable Butcher, but you don't have to, either. This is not your hippie grandma's greasy spoon. Here, generous portions of top notch, sustainably farmed meat (rich short ribs, succulent chicken, pineapple-braised pork) are elevated and celebrated alongside the quinoa, non-GMO corn, black rice, and roasted edamame. 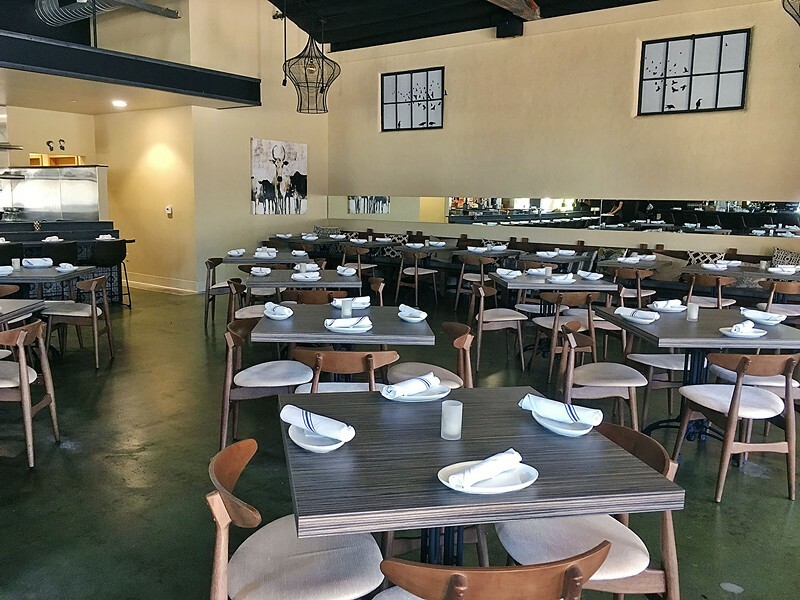 Becky and her husband of 23 years, John (who is just as ambitious), aimed to create an upscale yet casual restaurant with fun, approachable food that nourishes while it dazzles. This impression begins the moment you walk through the door, passing the life-size Day of the Dead-inspired skeleton as you go. The couple said the vast 3,500-square-foot restaurant "got a lot smaller" as they populated the space with tables, rustic burlap fabric, a bar, and a dining space that wraps all along the perimeter (this view gets diners as close to the action as they can get without physically entering the kitchen). 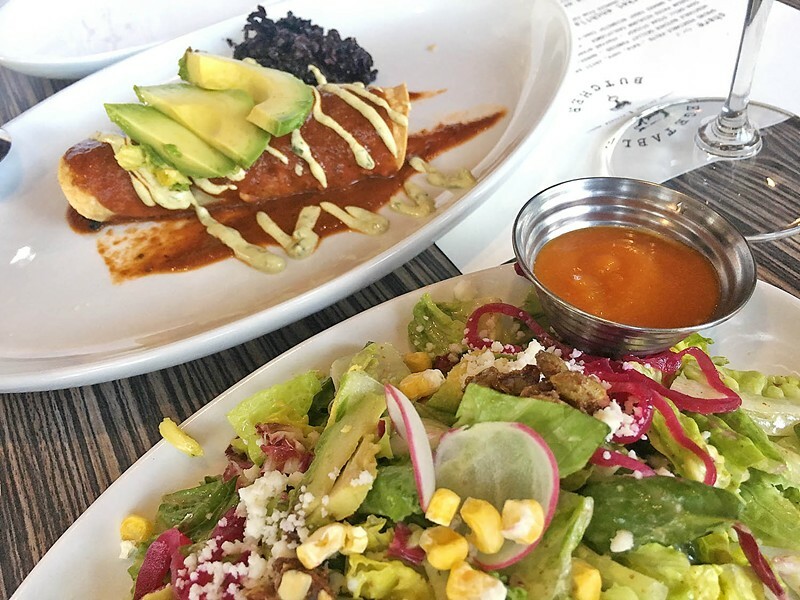 You can stop in for a quick taco-and-beans lunch, a full date night dinner of tamales, or a shared plate of Korean fried heirloom cauliflower and a drink after work. The worldly wine list is manageable with no fat, just the refreshing whites, dry sparkling wines, and medium intensity reds you'd expect to combat all that spice (Italian, Spanish, and French included). Plus, there's plenty of craft beer too, including offerings from Atascadero's Tent City and Paso's Silva brewing companies. PLANT PARTY The Vegetable Butcher's market enchilada filled with kale and black beans topped with cashew crema and avocado is paired with the Little Casa salad, with little gem, raddicchio, avocado, radish, hibiscus pickled onion, queso fresco, sweet dried corn, bourbon pepitas, and cilantro vinaigrette. The restaurant was crafted with the locals' wants in mind. In fact, John and Becky even asked people on the street what they felt downtown SLO needed. "People didn't want another burger joint," Becky said. As transplants from Arizona, the couple brings decades of restaurant-building experience to downtown. The year was 1991 when the lovebirds first met. Both were in their 20s, both were waiting tables in Phoenix. They soon married and started a catering business with another partner. "It all started right there, in 1995. The concept was from-scratch custom fresh farmers' market menus, before it was cool," Becky said. From a fraternity pig roast to an Indian wedding, the budding chef did it all. She had been gifted a love of whole ingredient cooking from her upbringing: Her mom ground her own wheat and made her own bread. "I've always been drawn to fresh cuisine and the ability to make something healthy that tastes great," Becky said. "I remember making a chickpea pita way back when, and hearing someone say, 'This is happy food.' That stuck with me." The catering company took off thanks to the couples' tenacity and passion. In fact, the business grew to bring in well over a million dollars in annual revenue, blossoming into two full scale restaurants in Scottsdale (The Herb Box), as well as a market, cheese shop, and bakery. "At our 20 year anniversary, I sold my shares to my business partner; I was ready for a new challenge and something I could be more intimate with," Becky said. "I wanted to get back to what had attracted me to cooking to begin with." VEG OUT The Vegetable Butcher offers up a flavor-melding World-and Latin American inspired menu that is not limited by its plant-based bias. The Central Coast's abundant flavors and agricultural offerings have provided a very good place to start. From week to week, the menu will showcase both what's ripe and what's tantalizing chef Becky's imagination. She might serve avocado and mint ice cream for dessert; but it really depends on the night. "I just got a bunch of beautiful gold heirloom tomatoes from Pepper Creek farms in Arroyo Grande, and I can't wait to make a Oaxacan tomato salad with pickled jalapeño," the chef said. "I love to play with textures and to have that surprise element. On Thursday nights, I just go right out the kitchen to the farmers' market." If that's not the way to create "happy food," I don't know what is. Hayley Thomas Cain eats her vegetables so that she can have smoked trout beignets for "dessert." She can be reached at hthomas@newtimesslo.com.